The Common Potoo is a nocturnal bird of Central and South America, known for its camouflage plumage and upright perching. Nancy Rumbel, who composed the theme music for BirdNote, improvises here with the call of the Common Potoo. Using the pentatonic scale of the potoo, Nancy responds with her ocarina. Be sure to listen to the longer version. And you can also catch a video of a potoo. Nancy: Well, I think birds are like natural musicians, so that when we hear their songs, immediately we do want to respond. Using the same pentatonic scale, she responds with her ocarina. Nancy: Often, I will make sketches before I will create a longer composition, so perhaps the Common Potoo song might someday develop itself into a longer piece of music. To hear more, come to BirdNote.org. Nancy Rumbel is part of the Grammy Award-winning duo Tingstad and Rumbel. 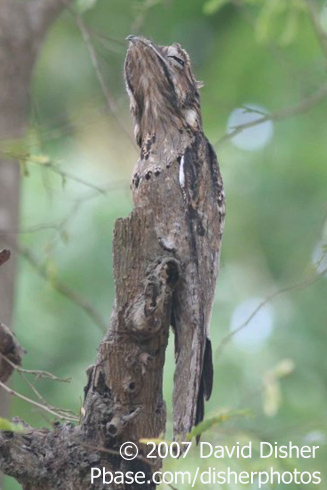 Common Potoo - Learn more!